Recall that Java has expressions to represent math and other computations. Expressions may use operators, which are evaluated according to rules of precedence. Every expression produces a value of a given type. String text characters "hi" + (1 + 1) + "u" "hi2u"
Write the results of each of the following expressions. If you're stuck, ask a TA or neighbor. Write the results of each of the following expressions. 2 + 6 + "cse 142"
jGRASP has a useful feature called the Interactions Pane that allows you to type in Java expressions or statements one at a time and instantly see their results. To use it, run jGRASP and then click the "Interactions" tab near the bottom. In this exercise, you'll use the Interactions Pane to quickly discover the result of some expressions that would be difficult to evaluate by hand. Copy/paste each expression below into the Interactions Pane to evaluate it, then input the answer into this slide. Recall that you can use a variable to store the results of an expression in memory and use them later in the program. Which of the following choices is the correct syntax for declaring a real number variable named grade and initializing its value to 4.0? Suppose later in the program's code, we want to change the value of grade to 4.0. Which is the correct syntax to do this? Suppose later in the program's code, we want to add 5 to the account balance. Which is a correct statement to do this? What are the values of a, b, and c after the following statements? Write your answers in the boxes on the right. A for loop repeats a group of statements a given number of times. Copy/paste the following code into jGRASP. Exercise : Verify solution in Practice-It! Our Practice-It! system lets you solve Java problems online. Go to the Practice-It! web site. Create an account if you don't have one, and log in. Copy/paste your program from jGRASP into Practice-It, and submit. If it does not pass the test, modify your code and re-submit it. What output is produced by the following Java program? 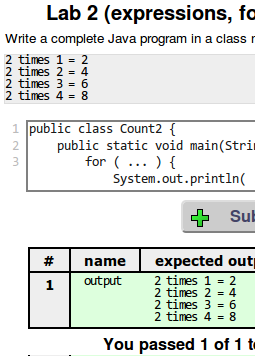 Write the output in the box on the right side. What output is produced by the following Java method? Hint: Think of each inner loop from 1 to X as a loop that prints X copies of the given character. The following program redundantly repeats the same expressions many times. Download it and open it in jGRASP, then modify the program to remove the redundancy using variables. Use an appropriate type for each variable. The program's output should be the same after your modifications. No expression should be computed more than once in the code. The following program contains 9 mistakes! What are they? Copy and paste the following code into jGRASP and correct the various mistakes. The answer is on the next 2 slides if you need some help. What are the values of i, j, and k after the following statements? Use the example program on the next slide to test your code. Copy/paste this program into jGRASP to test your solution. If you want an added challenge, try to come up with a way to compute the above value while using the * operator no more than 4 times. Create a complete Java program in a class named Bday that declares four variables and assigns appropriate values to them. My birthday is 9/19, and Suzy's is 6/14. Copy and paste the following code into jGrasp. Fill in the table below indicating how many stars appear on each line of output. Your program should now produce the correct output. You can verify with the Output Comparison Tool. You can use the Output Comparison Tool to check your work. Write a program to produce the following output using nested for loops. Use a table to help you figure out the patterns of characters on each line. Test your loop expressions in Practice-It! using the checkmark icon above. Use your expressions in the loop tests of the inner loops of your code. Write a Java program in a class named SlashFigure to produce the following output with nested for loops. Use a loop table if necessary to figure out the expressions. Test your code in Practice-It! or the Output Comparison Tool. Test your code in the Output Comparison Tool.